Truck beds have historically been made of steel, primarily because it was the only suitable metal available. However, aluminum truck beds have been steadily gaining in popularity since they entered the market in 2000. 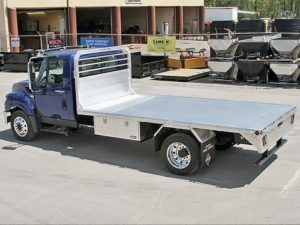 Aluminum truck beds offer seven benefits over steel beds, which are primarily the result of aluminum’s greater corrosion resistance and lighter weight. Aluminum is naturally resistant to corrosion without any special manufacturing process. Even with expensive measures such as stainless steel and galvanization, steel will always be more susceptible to rust than aluminum. Manufacturers can increase steel’s rust resistance by adding chromium, which also increases the steel’s cost. These alloys are known as stainless steel, although they aren’t truly rustproof. However, stainless steel is also weaker than other steel alloys. This property can be a significant disadvantage in loadbearing applications such as truck beds. Galvanization is another measure that manufacturers may use to protect steel truck beds. The surface of the bed is coated with a layer of zinc, which is highly resistant to rust. However, this process also increases the cost of the bed and becomes ineffective once the galvanic layer wears off. Aluminum’s natural corrosion resistance results in lower maintenance requirements, which primarily consist of lubricating the moving parts. Steel truck beds must be inspected regularly for signs of rust so that the appropriate maintenance can be performed. For example, any scratches in the paint must be touched up promptly before the exposed steel begins to rust. Galvanized steel beds require re-galvanization at periodic intervals. The repair of galvanized steel beds also require additional steps that aren’t necessary with repairs to aluminum beds. If the repair involves welding, the galvanic layer must first be removed from the work surface to expose the steel. Once the weld is completed, a galvanic layer must then be reapplied to the work surface. Even the simple act of removing and installing screws on a galvanized steel bed requires the reapplication of the galvanic layer. Aluminum beds also have a better resale value due to their superior corrosion resistance. Steel beds often have patches of rust, even when they’re only a few years old. These patches are usually conspicuous and difficult to remove. Rust can also represent a safety hazard when it affects load-bearing components. By comparison, an aluminum bed can retain its appearance for decades with minimal effort. A few minutes with a power washer and an oil-based cleaning solution is often all that’s required to make an aluminum bed look like new. Aluminum beds routinely have longer warranties than steel beds. Their greater corrosion resistance generally means that aluminum beds have a longer lifespan than steel, which is reflected by the longer warranty. Aluminum beds therefore represent a lower risk of investment than steel beds. Aluminum is significantly lighter than steel, although it’s generally not as strong. Aluminum beds must therefore be thicker than steel beds to achieve the same strength. Nevertheless, an aluminum bed is still lighter than a similar steel bed. For example, aluminum beds are often made of 6063 aluminum. A bed made of this aluminum alloy will be 10 to 15 percent lighter than a steel bed of similar strength. This weight reduction provides aluminum beds with several advantages, which become more significant as the size of the truck bed increases. For example, a steel bed for a commercial truck may weigh 4,000 pounds. An equivalent aluminum bed could weigh up to 600 pounds less, thereby increasing the truck’s payload by 600 pounds. An aluminum bed’s lighter weight may also result in improved fuel economy, especially for large, unloaded trucks. Many truck owners who have had both types of beds report better gas mileage with aluminum beds. Aluminum is more flexible than steel, meaning that it returns to its original shape more readily when it’s stressed. This property is technically known as a low modulus of elasticity, which is an advantage for truck beds. An aluminum truck bed produces a smaller impact shock when the truck is moving, resulting in a smoother ride. Some truck owners even report that a loaded aluminum bed gives a more comfortable ride than an empty steel bed.